If you’re looking to fit your property with a good security system it is vital that you choose a security installer in Sydney that will do the job right. But with everyone selling themselves as an ‘expert installer’, how do you sort the wheat from the chaff? 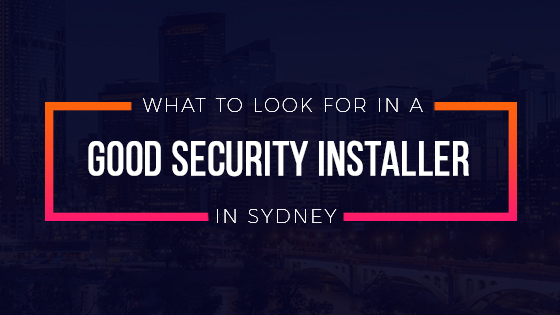 Here are just a few things to look for when selecting your Sydney security installer. If they can’t pick up their phone or answer an email in good time, do you really trust them to install your security system? You should also hold off on making the first payment until the installer actually arrives at your property to begin the work. Unfortunately there are some dodgy contractors who will take your money then never be heard from again. Does your preferred installer have past work that you can check out? There’s nothing more reassuring than a proven track record when you’re getting someone to complete such important work. Look for reviews of the contractor or company online, and try to find a past client who is happy to show you the work. Precariously placed cameras, exposed wiring and badly directed sensors are all things to look out for. Does the installer guarantee their work? If you have any issues with sensors, cameras or wiring that can be put down to workmanship, a good contractor will rectify these problems free of charge. You should not be expected to pay for someone else’s mistakes. Finally, while price is obviously a big factor in who you choose as a security installer in Sydney, don’t let it be the only factor. Be sure to weigh up their track record, their availability, and the quality of equipment they’re installing too. While you might save $50 by going elsewhere, that thriftiness could come back to bite you down the track. In reality, you’re looking for the same qualities in a security installer that you would in anyone who is providing a service. But remember that your security is on the line, so choose wisely. To find out more or for an obligation-free quote, call Red Handed Security on 1300 13 40 33.